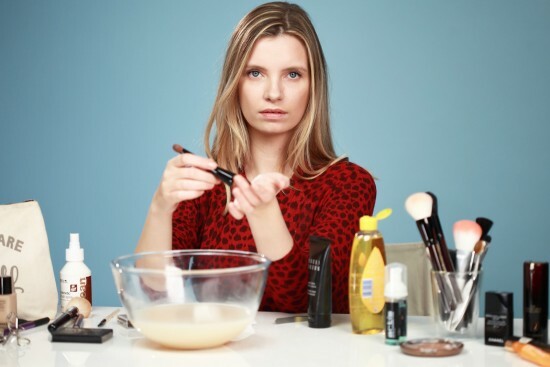 I have a new series of beauty videos running at The Telegraph; the Beauty Basics. They take some of the makeup tasks we tend to take for granted – applying mascara, grooming brows – and very simply describe how to do them. Great if you’re totally new to beauty and always at a loss as to how things should be done, but also good if you – like me – often develop bad habits and forget to pull yourself out of them. For ages I only applied mascara to the very ends of my lashes, for example – pure laziness, and I thought it looked ok, but on closer inspection it was a really crappy way of doing things. So I often do a complete “restart” when it comes to makeup application – make sure my foundation is the right shade, organise my brushes, pay a bit more attention when I’m sitting down to do my face… This Beauty Basics series is a brilliant reminder of the simple tricks that can totally transform your beauty routine and really improve your makeup look. You can watch the first video (on brush cleansing) here, the second, on perfect mascara application, is here.